UK Froot loops £2.68/350g box at TESCO instore and online!!!! 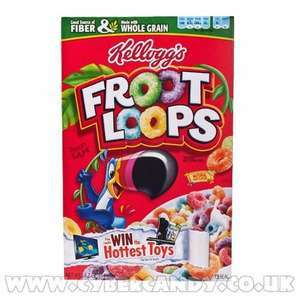 350g Froot loops cereal boxes for £2.68 at TESCO both online and instore. Been a long time since i have seen these in the UK, and they were labelled limited edition!!! Nom nom nom! Are these like the American ones? Who is voting cold, finally some fruit loops without paying £6.00 at amazon, Going to tesco this weekend. lets hope my shop has them. Are these the limited edition ones with added marshmallows? Damn I WANT Lucky Charms but at the high prices they are its not worth it. Where do I check the availability of them in my store? Damn I WANT Lucky Charms but at the high prices they are its not worth … Damn I WANT Lucky Charms but at the high prices they are its not worth it. Where do I check the availability of them in my store? A friend of mine went to the US recently and asked me if I wanted anything brought back. I asked him to get me TWO boxes of Lucky Charms. The look on his face! If you dump a shed load of sugar on top I bet all cereal tastes like Luck Charms. Half the price at the moment, and then the usual price is the same as Tesco. Heard they taste similiar but aren't the same. Thanks for this, didn't realise that and just checked and your right!! Voted cold, £2.68 is the normal price. As stated above premier stores have been/are selling these at 1/2 price (£1.34). Voted cold, £2.68 is the normal price. As stated above premier stores … Voted cold, £2.68 is the normal price. As stated above premier stores have been/are selling these at 1/2 price (£1.34). Yet again us British get a bland immitation of an excellent American product. WASTE OF MONEY!My first bowl today looked dull and on further inspection … WASTE OF MONEY!My first bowl today looked dull and on further inspection the box contained only purple, orange & green, no red, blue or yellow. Not too bothered about how they looked I continued to eat and found what it lacks in color it also lacks in taste! Only the orange ones seemed to have a 'froot' taste and the others no different to a multigrain cheerio :(Yet again us British get a bland immitation of an excellent American product. It is good to see that american goods are finally coming back to the UK! Amazing!It is good to see that american goods are finally coming back to … Amazing!It is good to see that american goods are finally coming back to the UK! Theyre not, the uk will only ever see watered down version of US food (thankfully). The FDA in america allows manufacturers to add as much MSG to food as they want unlike the uk. Anyone unsure about what MSG is have a read its a toxic addictive chemical that has no place in the human body, basically it tricks your brain into thinking the crap you are eating tastes good. Theyre not, the uk will only ever see watered down version of US food … Theyre not, the uk will only ever see watered down version of US food (thankfully).The FDA in america allows manufacturers to add as much MSG to food as they want unlike the uk.Anyone unsure about what MSG is have a read its a toxic addictive chemical that has no place in the human body, basically it tricks your brain into thinking the crap you are eating tastes good. Definately cold. They are horrible compared to the US Froot Loops. Only 3 colours, BLAND flavour. Also the US ones dont contain MSG just crazy chemical colourings which make kids hyper. It's a joke to label them with the same name. Don't bother with them. I got so excited when I saw them I bought 3 boxes. They have barely any taste. Only 3 different colours, and they look all faded. Nothing like they used to be. And nothing like the American ones. Thoroughly let down.